Rubber Room Ramblings: CONTEMPO CHRISTMAS FOR MY HOLIDAY STAMP-A-STACK! My monthly Holiday Stamp-a-Stacks will continue in October and November, and they are an awesome way to get your holiday cards made ahead of time while enjoying some relaxing fun with friends! Be sure to check my calendar for SAS dates and details! This is one of the four cards we will make during the October Holiday SAS. 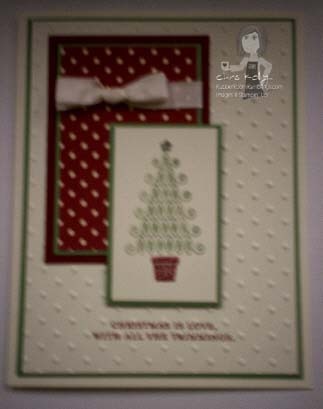 For this card we'll use the Contempo Christmas stamp set, a little Designer Series Paper, the Dotted Big Shot Embossing Folder and a little ribbon bow. There are lots of cardstock layers, but it is such a cute little card, all those layers are worth it!